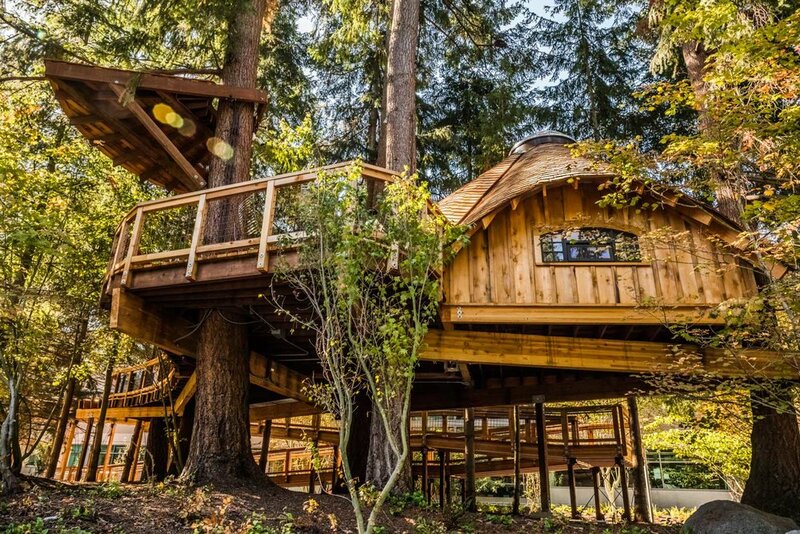 It was a delight to take to the trees at Microsoft's corporate headquarters in Redmond, Washington to build three treehouse work spaces for their employees. With two covered meeting rooms, ample deck space, and a lofty crow's nest, these treehouses bring employees into nature for improved focus and creativity. The treehouses range in height from 12 to 16 feet above the ground and offer sweeping views of the surrounding courtyard. A grove of Douglas fir trees supports the treehouses. Their location was once the site of a wood mill. The decking, railing, shingles, slab benches, and live-edge bar tops are all made of western red cedar. This imbues the treehouses with a distinctive, fresh aroma. A spiral staircase leads up to the crow's nest viewing platform. In total, the treehouses contain over 2,000 square feet of combined deck space and covered areas. Siding for the treehouses is made of reclaimed wood from floating house logs that once resided on Lake Union in Seattle. The tongue-and-groove flooring is also made of reclaimed wood. Using reclaimed wood resonates with the spirit of treehouses as it is an environmentally sustainable practice and endows the structures with a beautiful sense of local history! The first, meeting-space treehouse has a clover shape and is topped with a round skylight. Employees access this treehouse via a 250-foot ADA-compliant ramp. A Japanese wood-burning technique called "shou sugi ban" was applied to the cedar paneling inside this meeting-space treehouse. This gives the wood a natural finish and a deep, smoky hue. Wi-Fi is available throughout the treehouses, as are outlets for charging. Canopy roofs shelter the outdoor seating, making the deck a great place to work even in the rain. We hope you've enjoyed learning about our treetop work spaces at the Microsoft headquarters!